Want to get the revision test papers for CS Executive revision test papers? You are at right page. Here we are providing you the revision test papers for the students those who are going to write the CS Executive actual examinations. The candidates who have passed the entrance exam of the Institute of Chartered Accountants of India (ICAI) or the Institute of Cost Accountants of India (ICMAI) tare eligible to take direct entry in Executive Programme of the Institute of Company Secretaries of India (ICSI). CS Executive Programme level consists of only theoretical examinations. There are 6 subjects arranged into 2 modules of 3 papers. And each paper contains 100 marks. This paper provide an expert knowledge of the provisions of Company Law by developing an understanding of the regulation of companies. And it is also provide the knowledge of various provisions of Company Law to the students at Executive Programme level. For preparing this paper you have to understand the various provisions of the Companies Act is must. The Cost and Management Accounting paper provides knowledge of principles and techniques of Cost and Management Accounting. You have to answer the questions with due emphasis on the principles of respective concept in this paper, and solve practical problems as much as possible. The Economic and Commercial Laws paper has been divided into two parts consisting of fifteen study lessons. The candidates who are preparing for this Economic and Commercial Law paper must answer the questions with due emphasis on the provisions of law. The students who are preparing for Tax Laws and Practice paper have to practice as many practical problems as possible. And they have to understand theoretical concepts and apply these in practical scenario. The Practice filing the income tax Return, service tax return, VAT return under an expert guidance. Company Accounts and Auditing Practices paper is designed to provide the students advance knowledge of the principles and practices of company accounts and auditing in accordance with statutory requirements. It is a practical subject so the students are advised to solve the practical problems. Capital Market and Securities Laws is a very important subject of the CS Executive Course. Students are advised to read Student Company Secretary, Bare Act, recommended books Chartered Secretary, and other publications which are related to this paper. The Capital Market and Securities laws paper provides an understanding of industrial, labour and general legislations. Students are advised to focus on mainly the topics of procedural formalities required under Industrial, and Labour Laws. The candidates those who are going to CS Executive must focused in time management specially in solving the practical problems. To understand theoretical concepts rather than routine learning. 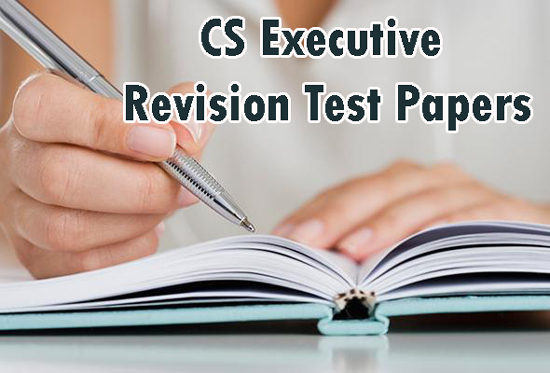 Here you can download the CS Executive revision test papers. For downloading the test papers you have to click on given below links. From the above links you can also get suggested answers for the CS Executive revision test papers. So, Click on the above links and download these CS RTP and Suggested Answers in pdf format.